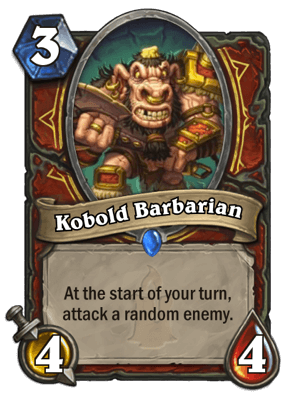 Warrior was the worst class in KFT. Did it pick enough from K&C to return to its former glory? Click here to read my other written set reviews! Each card is rated on a scale of 1 to 5 on two criteria: Power and Versatility. The Power rating reflects how much I expect a card to impact the game when played. Cards which immediately represent multiple cards worth of value (Ultimate Infestation) or have a powerful effect on the board for their mana cost (Sunkeeper Tarim) will receive high Power ratings, while cards which have a low impact on the game (Ice Breaker) or cost too much for their effect (Furnacefire Colossus) will receive Power low ratings. The Versatility rating is intended to communicate how dependent a card is on other cards for its success. Cards can be very powerful without being versatile at all (Clutchmother Zavas), which means that many exciting and powerful cards will end up seeing very little play once the metagame is established. A high Versatility rating means a card relies very little on other cards to be good, and the more comfortable I would feel crafting that card on day one. A lower Versatility rating doesn't necessarily reflect that I expect the card to be bad, but that I wouldn't feel comfortable crafting it until it has proven itself to be a part of a competitive deck. As powerful as a few of these modes are, I expect the inconsistency of Unidentified Shield to hold it back from ever seeing widespread play. 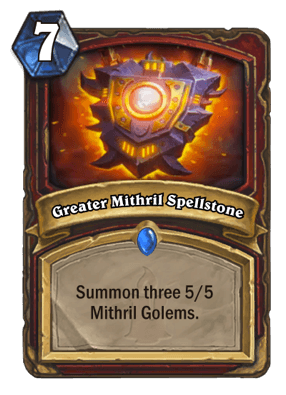 However, the dedicated Warrior Recruit deck is going to need to find some ways to fill up its deck with spells that back up its powerful minions. I could see this making the cut in early Recruit builds, but I'm not very confident that this card will have staying power. 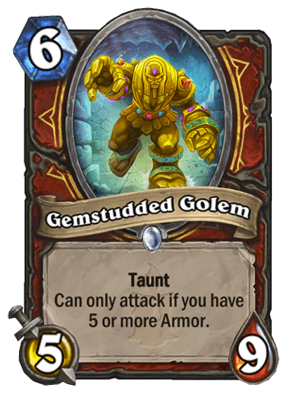 A 5/9 Taunt for 6 mana is quite impressive, and I doubt that the card's drawback will be enough to keep it out of Quest Warrior lists. 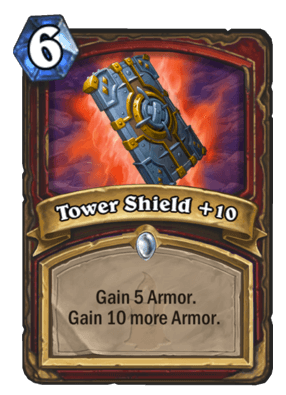 Decks that can reliably get 5 or more Armor on turn 7 will probably be interested in the card's massive body, but I don't think it'll be strong enough to sneak its way the average Control Warrior deck. A 3 mana 4/4 might is tempting for aggro decks, but the fact that this isn't a Pirate and will frequently attack the wrong target is far too much of a drawback to make up for its impressive body. 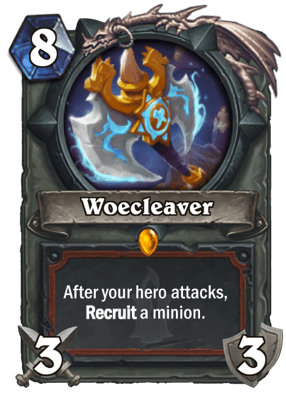 Well-designed Recruit decks are going to consistently grab The Lich King, Ysera, and Y'Shaarj, Rage Unbound with this card. We already know how powerful that is in Big Priest decks with Shadow Essence, and you could make the case that Gather Your Party is even better. I expect this card to be a lynchpin for the new Recruit Warrior archetype. 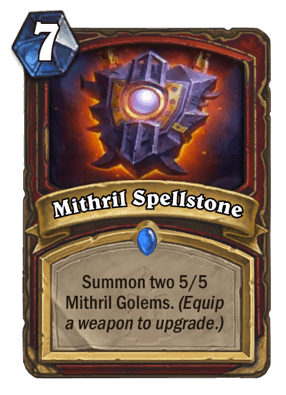 Mithril Spellstone might end up becoming a necessary evil in Recruit decks with access to limited minions, but its probably a bit too expensive to make a splash in normal Control Warrior lists. 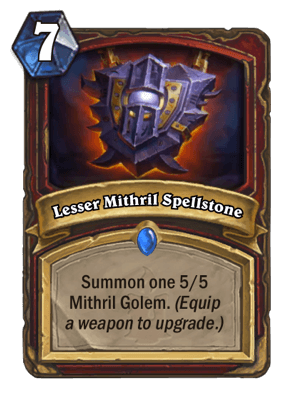 The Lesser version is terrible, which means you'll need to be comfortable with running a healthy number of weapons to upgrade this card to its playable Normal and Greater versions. A 2 mana 2/2 isn't going to blow anyone away in the early game, but there may be a few defensive Warrior decks which will begrudgingly play this card. 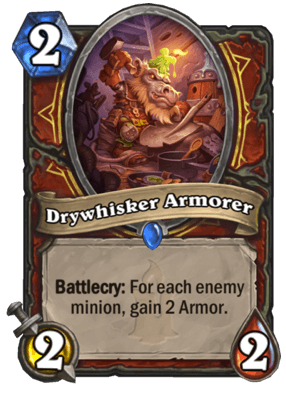 Drywhisker Armorer becomes enticing if the opponent has three or more minions on board, but keep in mind that there will be plenty of matchups where your opponent isn't looking to go wide. I'm concerned that this card has too high of a setup cost to see widespread play, but could see it creeping its way into a few lists in hyper-aggressive metas. 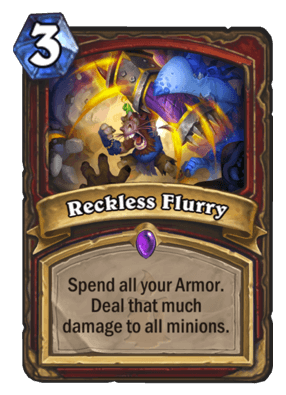 Control Warrior suffered a mighty fall from grace after the nerf to Fiery War Axe, and I expect to Reckless Flurry to turn that around. The floor on this card (5 mana, deal 2 damage to all minions) is fairly stable, while the ceiling is off the charts. 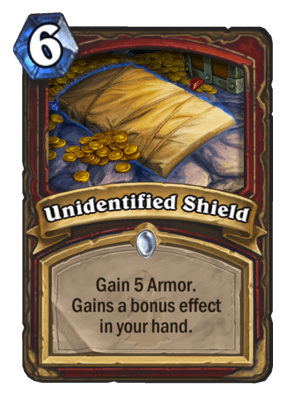 I love how the design of this card forces players to wrestle with managing their life totals in exchange for board presence, and expect that this card will reward players who are able to intelligently map out their turns and manage their Armor count. On first glance I thought that Bladed Gauntlet would be the savior of Control Warrior, but on second thought I think this one won't find its way into decks that aren't built to maximize their Armor count. 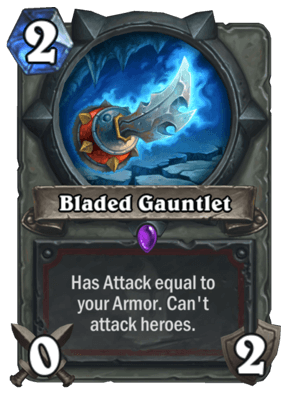 Bladed Gauntlet obviously gets weaker as you use it to kill your opponent's minions, and you will be least likely to have leftover armor sitting around when you need it most against aggressive decks. I can see some strong turns with Bladed Gauntlet into Shield Block, and it can also be used to gobble up your opponent's nastiest threats in combination with Bring It On!. I expect Bladed Gauntlet to be a solid, playable card that replaces Fiery War Axe in a number of Warrior lists, but it won't define the meta. Recruit decks will be happy to play a card that will pulls three of their big and nasty minions onto the battlefield. Everything else can probably find something better to do with 8 mana. I've seen a lot of people compare Geosculptor Yip to Rotface, but I think this card is way better. The floor for this card is that you play it on turn 8 and Armor Up, netting you a 4/8 and a 2 drop, which isn't awful. The more likely scenario is that you play this in a deck that runs a high number of Armor-matters cards and get a 4/8 and a random 5 or 6 drop for 8 mana, which is awesome! 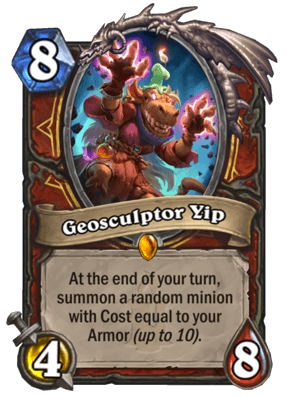 Yet another card that combos with Bring It On!, I expect Geoscupltor Yip to see a fair bit of play in slower Warrior decks. Warrior holds the unfortunate distinction of being the worst class in the current meta. Though Warrior didn't improve as much as some of the other classes did in K&C, it feels as though Control Warrior picked up enough new cards to return to relevancy. 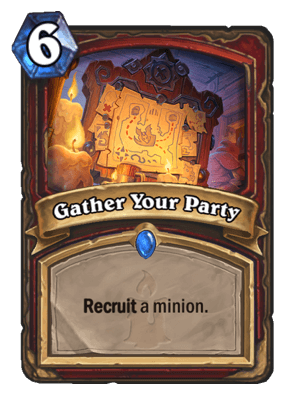 Warrior also got the best Recruit spell from K&C in Gather Your Party, which gives "Big Warrior" a reasonable shot at becoming one of the top dogs in the new meta.